Photograph courtesy Ian Hammond Its July 30th 1977 with 25187 & 25269 at sunny Paignton, recently arrived from Birmingham New Street. D7537/25187 was another of the Class 25 fleet to be allocated only to London Midland Region depots, in this case for seventeen years and eight months and allocated mostly to Midland & London area depots. Time between last Classified repair and withdrawal: 66 months. August 1967 to Birmingham Division (D16). July 1969 to London Division (D01). 25187 was the 150th Class 25 withdrawn, one of twelve retired during November 1982, including sisters 25177, 25179, 25180 & 25186. After withdrawal 25187 was stored at Saltley from November 1982 to February when it was moved to Bescot (see detail below). 25187 remained here until moved to Swindon Cocklebury Yard on July 11th 1984 and into Swindon Works by July 25th 1984. By the end of January 1987 25187 had been scrapped. 25067, 25101/157/187 Wolverhampton (25067) – Bescot – Swindon Works, July 6th - 11th 1984. Noted Derby Works April & May 1977. Noted Derby Works November 1978. The 07.35 Nottingham - Llandudno Town and 13.52 return on June 14th 1969 were worked by 7537 & 7533. The Women’s International Hockey Match at Wembley on March 14th 1970 brought four specials, two led by 1727 (Wolverhampton) & 95 (Nottingham), the others had class 25 haulage from Willesden with 5185 on thirteen coaches (Crewe) and 7537 & 5219 on sixteen coaches to Barrow. Condition April: two-tone green livery with full yellow cabfronts, no blanking plates, hand/footholds plated over, straight sided sandboxes, three rung bogie mounted footsteps, 'D' prefix present, engine exhaust located above engine room. A day excursion on May 27th 1973 from Burton on Trent to Yarmouth was worked out and back (?) by 7537 & 7664. On July 6th 1974 25187 & 25262 worked the full Derby - Norwich - Yarmouth - Norwich - Walsall diagram. Presumably deputising for a missing diesel multiple unit, on September 6th 1974 25187 worked the 10.30 Worcester Shrub Hill - Birmingham New Street, via Stourbridge Junction. On September 28th 1974 25187 & 25273 worked the 08.00 Walsall - Norwich and 15.18 return. 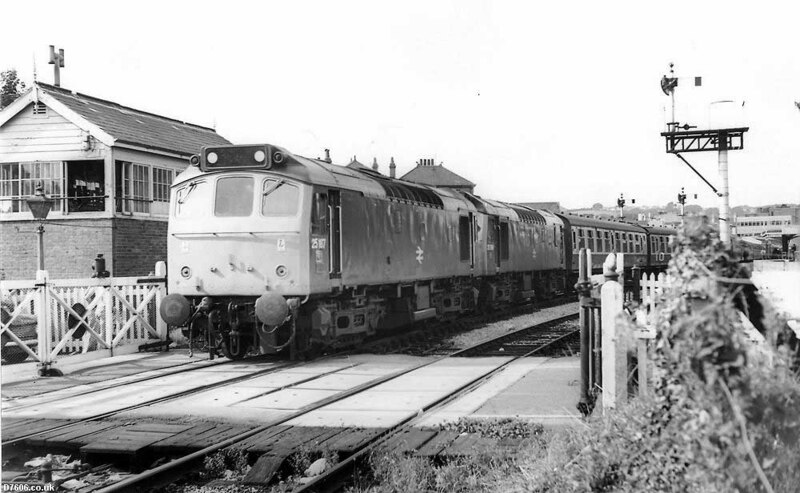 On July 5th 1975 the 08.52 Leicester - Skegness and 12.30 return were worked by 25187 & 25269. 1977 produced a number of sightings of 25187 on passenger workings but with some sketchy details. On May 29th a charter believed to have originated in the West Midlands worked through to Porthmadog from (?) Wolverhampton with 25187 & 25179. Two months later on July 30th a NE/SW working from Birmingham New Street to Paignton was worked by 25187 & 25269, quite where the working started is uncertain, either Nottingham (9.47) or Leicester (9.34). On August 7th the 08.45 Birmingham New Street - Barmouth and 17.30 return were worked by 25187 & 25325. Two weeks later on August 21st a Wellingborough (?) - Barmouth mystery excursion was worked out and back by 25187 & 25262. Skegness was the destination for excursions on August 29th & 30th with 25187 & 25145, the starting points not yet known for either date. The same pair were still together on September 4th 1977 and worked the 08.45 Birmingham New Street - Barmouth from Shrewsbury and the 17.30 return as far as Shrewsbury. 25187 worked the coal train to Stourport power station on October 28th. A Bewdley - Paignton charter on May 6th was worked the five miles out & back to Kidderminster by 25187 & 25261. At noon on August 8th 25187 was noted at Saltley depot. 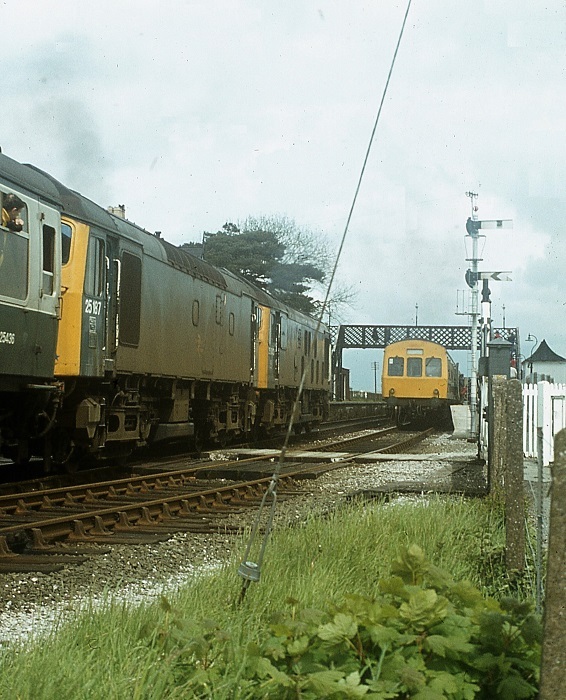 Photograph collection of webmaster 25187 & 25043 cross with the local diesel multiple unit at Harlech on May 29th 1979. 25187 was receiving attention at Reddish on May 4th & 5th, the bogies having been removed. During 1980 two trips were worked over the Cambrian lines, on July 26th the 04.10 Shrewsbury - Aberystwyth and the 10.07 Aberystwyth - Euston to Wolverhampton were worked by 25187 & 25272. The next day (27th) the same pair worked the 08.45 Birmingham New Street - Aberystwyth and the 18.10 Aberystwyth - Euston to Birmingham New Street. On July 21st 25157 & 25187 were in charge of the 07.20 Newcastle – Leeds parcels. On March 26th 25168 & 25187 worked a Penyffordd - Oakengates Cement Yard cement train. 25187 was stabled at Cardiff Canton on April 4th. 1981 produced another Cambrian line working, on June 13th 25187 & 25090 worked the 07.40 Euston - Aberystwyth from Wolverhampton, returning with the 16.05 Aberystwyth - Wolverhampton. The next day (14th) the same pair worked a roundtrip 08.40 Birmingham New Street - Blackpool North day excursion, the outward journey was via Cannock, Stoke on Trent & Manchester Victoria, the return was via the WCML direct. The final recorded passenger workings for 25187 took place on October 19th 1982 with the 09.53 Bangor - Manchester Victoria and 13.45 Manchester Victoria - Bangor. On October 23rd 25187 was noted passing Beeston Castle & Tarporley hauling 47207, 25199 and another Class 25 towards Crewe. 25187 was withdrawn on November 28th 1982. Page added July 16th 2013. Last updated January 17th 2019.